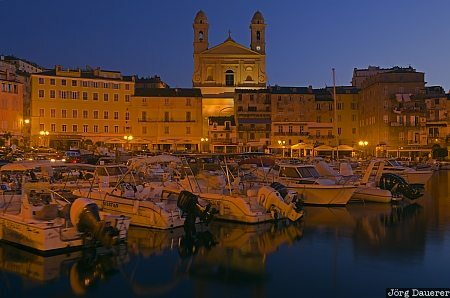 The old harbor of Bastia (vieux port) with the flood-lit church Saint Jean-Baptiste in the background at the blue hour just before sunrise. Bastia is in the south of Cap Corse in the north of the mediterranean island Corsica, France. This photo was taken in the morning of a sunny day in September of 2011. This photo was taken with a digital camera.